Outstanding Ocean Views & a location that is just steps from the Beach make this Fantastic Townhome a great choice for your family's Outer Banks vacation. Relax & enjoy the cool Atlantic breeze from your covered porch or watch the waves roll in from the top level Sun Deck, the views are endless. This home is well equipped, very comfortable, & each bedroom has TV. The main living area is bright & open w/ windows along the Oceanfront to take advantage of the wonderful views. On the top level there is a grand Oceanfront Master Suite that has a Full Bath w/Jacuzzi & a Sun Deck. The Community Swimming Pool will be a nice change of pace after spending the day playing in the surf. Ground Level: Parking for 3 Cars, Enclosed Outside Shower, Fish Cleaning Station, & Walkway to Beach. Mid Level: Living/Dining/Kitchen Area, Great Ocean Views, Large Flat Panel TV, DVD, Wet Bar, Bedroom w/Queen, Half Bath, & Covered Deck w/Hot Tub. 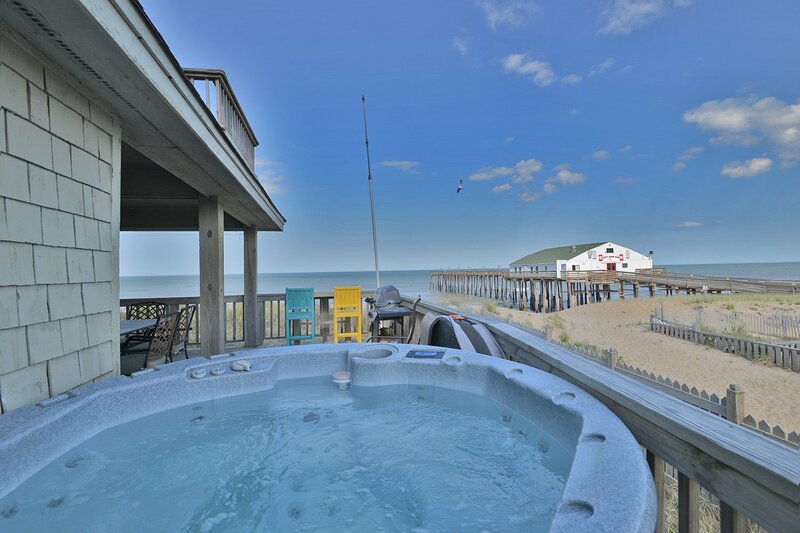 Top Level: 3 Bedrooms (Oceanfront Master Suite w/King & Full Bath w/Jacuzzi, 1 w/Queen, & 1 w/ Queen & Bunk Set), Full Hall Bath, Laundry Area, & Sun Deck. Features include: C/AC & Heat, Washer/Dryer, Dishwasher, Microwave, Phone, Ceiling Fans, TV, VCR, DVD, Wireless Internet, & Outstanding Ocean Views. A Member of the Southern Shores Civic Association (SSCA) which provides you w/No Fee Access to 4 Miles of Southern Shores Beaches w/Parking, Boat Launching Area, 3 Soundside Marinas, Soundside Bathing, Beach, & Picnic Area, Sea Oats Park/Play Ground, & Walking/Biking Trails, & Member SSCA Tennis Club. No Pets. This is a Non-Smoking Unit. Wonderful location and floor plan is great. Loved decks and porch. Shore Escape was a perfect place to stay for our vacation. The home was well equipped and met all the needs for our kids and Grand kids. We had a great visit and plan to return! This is a terrific home for families and a huge bonus to have front yard grass where we played whiffle ball with the kids most evenings. Location is wonderful and don't have to deal with traffic. Being on the beach is less effort to enjoy the day and so easy to run back for food/drinks or to rest! Beautiful home! We enjoyed watching dolphins swim by from the large windows facing the ocean. Location was very convenient to stores and activities. The kitchen was very well equipped. The hot tub was great and they had plenty of chairs outdoors to sit on. Nice decor. Love the hot tub. Great master suite. Your house is in a great location and the overall interior is nice. Beautiful view! I will definitely consider returning next year! Kitchen is updated and well stocked. The hot tub provides great views as well.